“A picture is worth a thousand words.” “The proof is in the pudding.” Both phrases that could apply to this past weekend’s State Championship contest held in Bartow FL. There were a total of 62 teams on hand, all vying for the top spots. When the final scores were tallied it was a dominating sweep by Swamp Boys Q School Alumni, taking nearly 30% of all the calls! In the Pro Division, Whiskey Bent won Grand Champion and Big Bad Wolf won Reserve Grand Champion, out of 46 Pro teams. The lowest overall scoring Q School grad was a very respectable 10th out of 46. In the Back Yard division, it was Q School Grad Sho Gud who walked away with the Grand Champion honors in their early competition career. The next Swamp Boys Q School will be announced very soon. Will you be in it? Q School Grads racked up! A Perfect Score and a GA State Championship! In the 10 years the FBA has been in business there has never been a perfect score. That means that out of an estimated 16,000 bbq entries that have been turned in for judging in the FBA, not once has each of the six judges given an entry a 10 in Presentation, a 10 in Taste, and a 10 in Tenderness. That is until now! 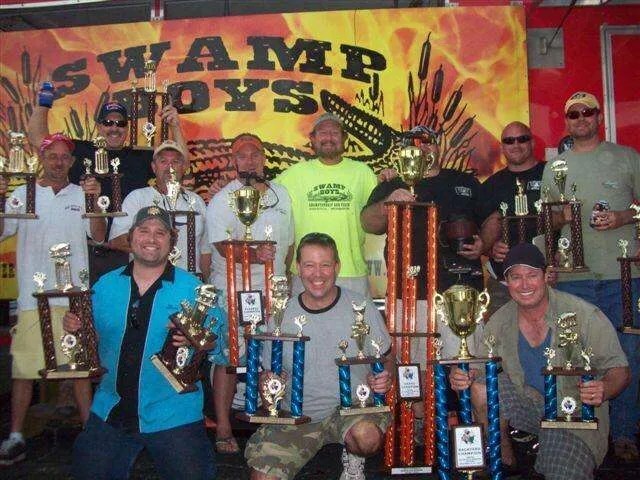 October 16, 2010, Swamp Boys became the first team in the history of the FBA to receive a perfect score, which was awarded in the Rib category. Honored, humbled, excited, and proud are just a few of the emotions I experienced that day. And then to make it all that much better, I won Grand Champion in a very tough field of my peers. And then lightening struck again: Wooley Bully BBQ – a graduate of Swamp Boys Q School – scored the seecond ever perfect score, this time in Brisket. It was a great day, at a great contest, with great friends! The Jack 2011: 2nd Qualifier!